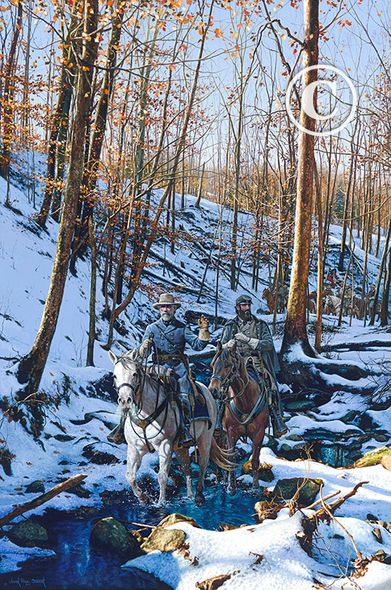 John Paul Strain Hand Signed and Numbered Limited Edition Giclee:"Winter Shadows of 1862"
Image Size: 19 1/2" x 29 3/4"
Edition: Artist Signed and Numbered Limited with COA. Medium: Giclee on Paper and Canvas. Select option from Drop Down Box. 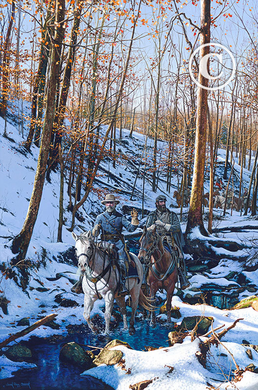 About the Art: The year of 1862 had been one of glorious victories with General Robert E. Lee and General Thomas J. Jackson commanding the armies of Northern Virginia. Thirteen battles, great and small had been fought and won during the significant year. From Mc Dowell, Port Republic, Cross Keys, Mechanicsville, Gaine's Mill, Savage Station, Frayser's Farm, Cedar Mountain, Second Manassas, Boonsboro, Harpers Ferry, Sharpsburg, to the great victory at Fredericksburg, it seemed nothing could stop the Southern Armies fighting for their independence. The morale of the Army of Northern Virginia was high with expectations that the leaders of the North would in time negotiate for peace. Now the cold winds of winter had arrived and Lee and Jackson had much work to do. Their victories had been costly with the loss of many men and great leaders. Just in the Seven Days' Battle, Lee had lost fifteen brigadier generals. The task now at winter quarters was to fortify the entire front of the Rappahannock, reorganize their command, and replace those that had been lost. In a letter to his wife on Christmas Day, General Lee wrote, "My heart is filled with gratitude to Almighty God for His unspeakable mercies with which he has blessed us this day,.......and particularly for those he has vouchsafed us during the past year. What should have become of us without His crowning help and protection?........I pray that, on this day when only peace and good-will are preached to mankind, better thoughts may fill the hearts of our enemies and turn them to peace...."